Teaches all ages and levels. Fun energetic & creative throughout the experience! I love being on court and enjoy teaching the game. I have an extensive sports background, and like to bring many different skills to tennis in order to reach out the best in each player. I also provide individual and group TOTAL TENNIS FITNESS for intermediate and advanced players--a fun way to work out and get in shape playing tennis. Hisham can recommend a location or come to any court inside the highlighted service area below. "Hisham is hands down the best coach out there! He knows his game and even more importantly he knows how to teach and take you to the next level. I learned so many new things today that will improve my game immediately! I will never need anothwr coach as long as Hisham is available!!" "Extremely energetic. Hisham went out of his way to figure out what I needed (and wanted) to work on. Definitely not your standard feed a basket of balls and give you few nuggets type of lesson. He will push you as far as you want to be pushed." "Fantastic. Hisham was perceptive , knowledgeable and a pleasure to play with." "Lessons were great, he took his time and gave me great stuff to try out!" "Very well and thorough. " "Originally when I booked my first lesson with Hisham, the gentleman on the phone told me that he was one of the highest rated coaches on PlayYourCourt across the whole U.S. After my first lesson, I quickly understood why. Hisham is a world-class coach that has serious passion for the game. His enthusiasm and positive attitude make each and every lesson so much fun. Hisham always knows exactly what to teach me in order to take my game to the next level. If you’re on the fence about hiring Hisham, do yourself a favor and book him. " "Really like my first lesson. I got good pointers worked on my back. Very positive coach.👍🏽👏🏽👍🏽"
"He is extremely thorough and patient, and most importantly, he listens to you to make sure you are grasping what he is teaching. He brings a passion to his teaching and tennis, in general, which is very refreshing. " "My first lesson with Hisham was excellent! 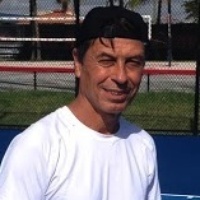 Hisham brings a wealth of knowledge and experience in the game of tennis, and he is a superb instructor. He was very patient and personable. I look forward to working with him to improve my tennis skills. " "He is very experienced and easy to work with, a good coach!" "He is amazing!! 5 stars for sure. " "He was great, very patient, and really listen to my needs. I will book him again for sure!" "Excellent training session to improve forehand and backhand techniques! Also, great drills to polish up foot work and movement around the court. Will definitely be rebooking with Hisham again soon!" "I was very satisfied with the personal attention, enthusiasm, and customized class offered by coach Hisham. He seems very good with children and is flexible enough to adapt to each leaning style." "My parents used Hisham for their first lesson and they cannot say enough how great he is! They would highly recommend him to anyone looking for lessons and a lot of laughs. Thank you so much to Hisham for making this Christmas gift to my parents AWESOME! They have found a new tennis instructor." "Hisham is a class act. He is on time, very skilled and provides instruction when asked. He is always looking to help improve your game and is a great coach. Very energetic and fun. 5 stars "
"I highly recommend Hisham to anyone. He was great and very accommodating. His instruction style is fun and informative. I'll be looking forward to more learning with him in the future." "Hisham was a wonderful instructor and incredibly knowledable. Very patient with my son. I would highly recomend him!" "Above and beyond an excellent coach. Got me back up to speed quickly as I hadn't played in quite a while." "Hisham is wonderful! He's patient with each one of my kids and teaches to their level. They have fun but they are learning so much too. They love to go to tennis lessons!" "Hisham is just what I was looking for, very professional, knowledgeable, skilled and patient, right the way he accurately pin pointed what I was doing wrong with my forehand and backhand and he proceeded to gradually modify my strokes for the better, I felt very good by the end of the lesson the way i was hitting the ball!! he is also super nice and mindful of your health and conditioning, he even brought water and power bars! all throughout the lesson he kept breaking for water and power bar bites to keep he energy going. I will definitely keep all the 12 lessons I booked with him and keep taking lessons after that as well !! " "Hisham was an absolute delight to work with. It was the first tennis lesson ever for my 16-year-old son and I, and Hisham was very patient and forgiving of our rookie status! :) His enthusiasm for the game is contagious, and both my son and I are looking forward to our next lesson. "